Sebastian Buemi, Lucas di Grassi, Nick Heidfeld and Sam Bird all hit trouble late on to give the Portuguese a memorable victory, Amlin Aguri’s first of the season. Buemi had led away from pole at the start of the race and looked in control until after the first pit stops but eventually buckled under pressure from di Grassi, clipping the wall at the high-speed chicane. Di Grassi’s lead lasted just two laps before his suspension snapped at the same point, promoting Heidfeld up the order. But the German’s hopes of victory were then undone when he received a drive-through penalty for speeding in the pit lane. Da Costa had already been elevated to second when Bird was handed a drive-through penalty of his own. 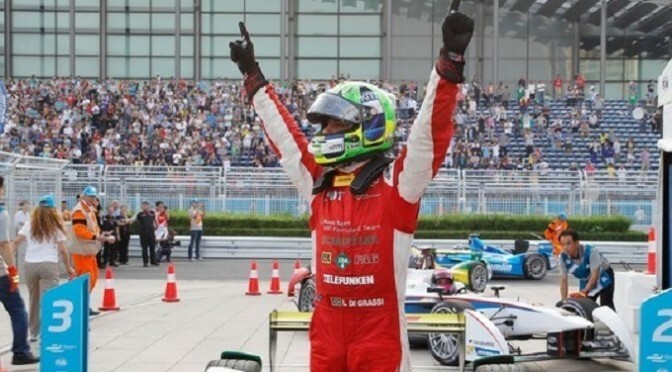 Audi Sport ABTâ€™s Lucas di Grassi stole victory in the inaugural Formula E Evergrande Spring Beijing ePrix after Nicolas Prost and Nick Heidfeld crashed in a last corner battle for the lead. Heidfeld walked away unscathed from a nasty looking incident after contact with Prost left him unable to control the car and flipped into the tyre barrier. As the pair approached the final corner the Venturi driver dived up the inside in an attempt to the take the lead. The Frenchman moved left to defend and inevitably lead to their wheels colliding. After clambering out from underneath the car Heidfeld, clearly aggravated, confronted Prost. However, Di Grassi wonâ€™t complain as he picks up the full 25 points and with it takes the lead of the championship. Andretti driver Franck Montagny finished runner-up nearly three seconds adrift of Di Grassi as the Brazilianâ€™s team-mate Daniel Abt crossed the line in third place. On return to the pitlane Abt was handed a time penalty for exceeding the battery consumption. The German driver used 28.2kW of the allocated 28kW available. Katherine Legge and Jaime Alguersuari were also penalised for being over the limit. Virgin Racingâ€™s Sam Bird was eventually promoted to claim the final place on the podium. Andrettiâ€™s new signing Charles Pic put on a strong display to finish fourth ahead of Karun Chandhok. 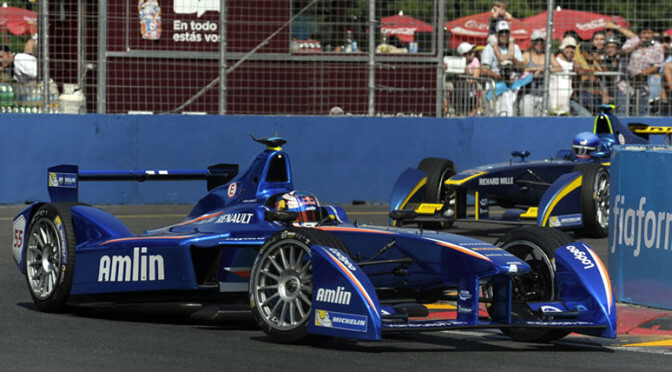 Mahindra team-mate Bruno Senna retired on the opening lap after being squeezed between the two Amlin Aguri cars. The Brazilian broke his left-front suspension and consequently brought out the Qualcomm Safety Car. Despite topping four of the five pre-season tests, e.dams-Renaultâ€™s Sebastien Buemi failed to finished after retiring on lap 19. Takuma Sato picked up two points for Amlin Aguri posting the fastest lap of a 1.45.101 in the final moments of the race. After a dream start in the first ever Formula E race in Beijing, Lucas di Grassi begins his title assault on the Barcelona World Cup.